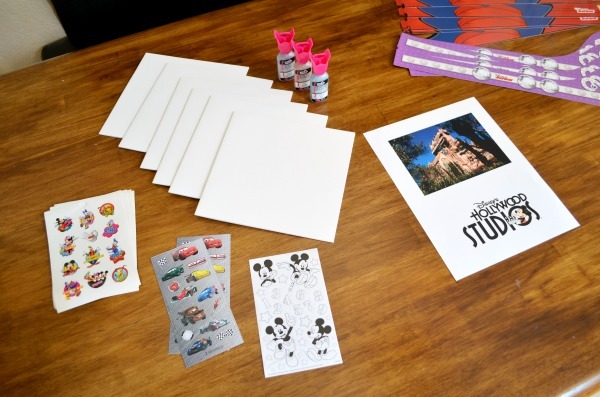 Walt Disney World with Mom Select sent me a box of goodies to host a fun filled #DisneyKids Preschool Party. 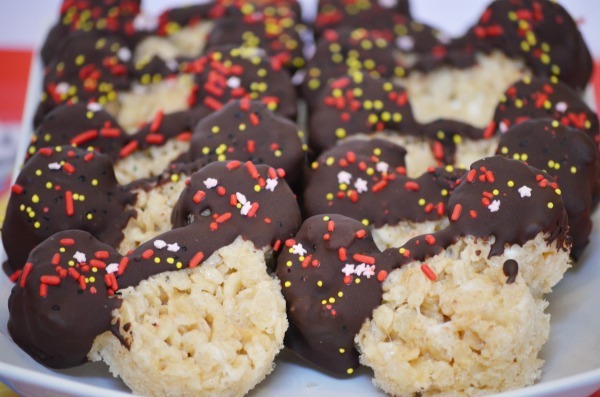 These treats were just one of the copycat recipes found on our tour of the parks and a few fun Disney Parks activities. A true Disney Parks experience is never complete without a tour of your favorite food spots. It’s all apart of the magic, right? I’m sure everyone has their favorites, but I think most can agree if it’s Mickey shaped it just tastes better. On my trip back in October to experience the Diamond Celebration at the Disneyland Park I had my first taste of a Mickey Rice Krispy Treat, yum. 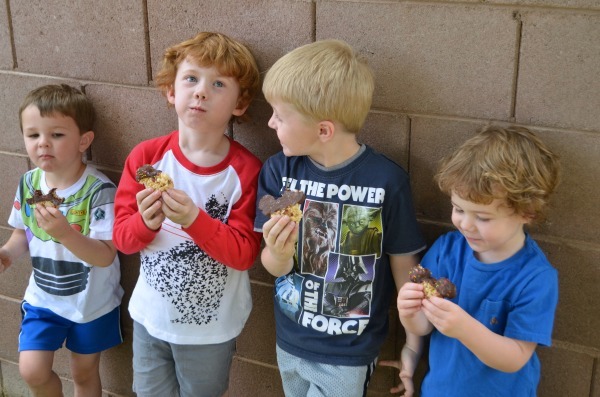 A delicious crispy treat, ears dipped ever so lightly in chocolate. It has quickly made its way to the top of our family’s favorite park treat. 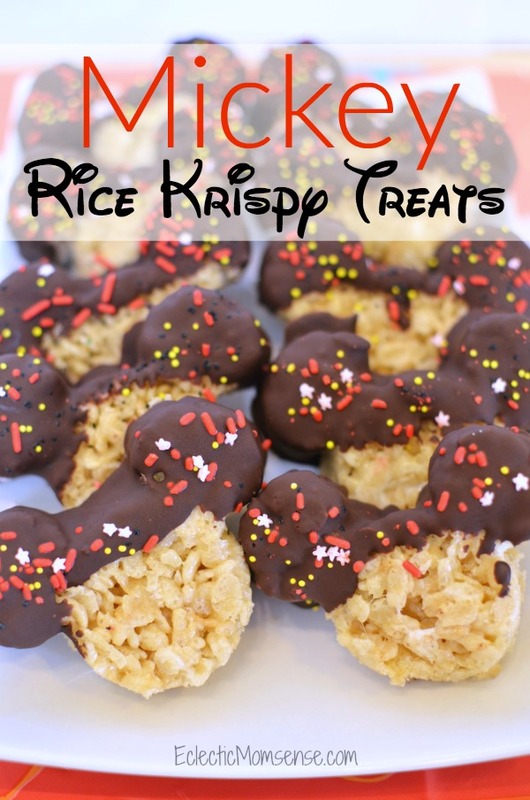 And now you can bring the taste of the parks home with this super simple Copycat Mickey Rice Krispy Treats recipe. Begin by melting the butter and marshmallows in a large microwaveable bowl. Add crisp cereal to the mixture, stir. Place rice mixture onto a parchment lined jelly roll pan. 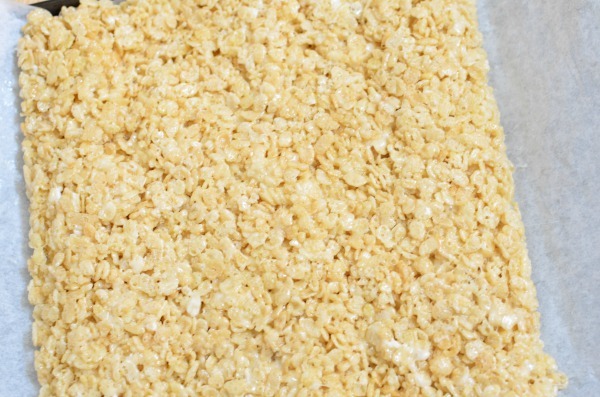 Fold the excess parchment paper onto the rice krispy treats. Using your hands or a rolling pin continue to work the mixture until it is completely flat. Place mixture in the freezer for 5 minutes to set. 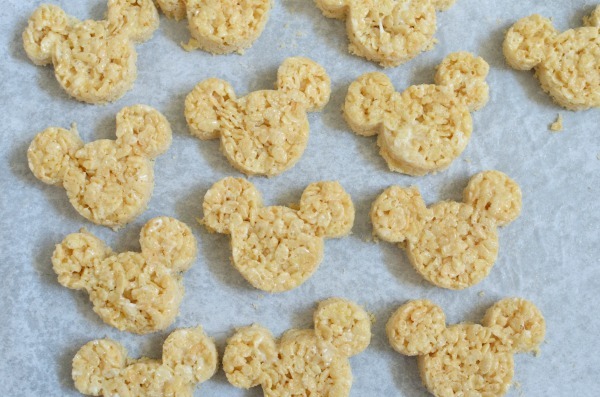 Cut out Mickey shapes with a cookie cutter. Place treats back in the freezer while you prep the chocolate. Melt dark chocolate according to package instructions. Dip just the ears into the chocolate. Place back onto parchment and add sprinkles. Microwave butter and marshmallows in a large microwaveable bowl for 2 minutes on high. Stir, continue heating in 30 sec. increments until fully melted and combined. Add crisp cereal to the mixture, stir. Place rice mixture onto a parchment lined jelly roll pan. Spread with a spatula until flat. (mixture should fill about ½ a standard size pan at 1" thick). 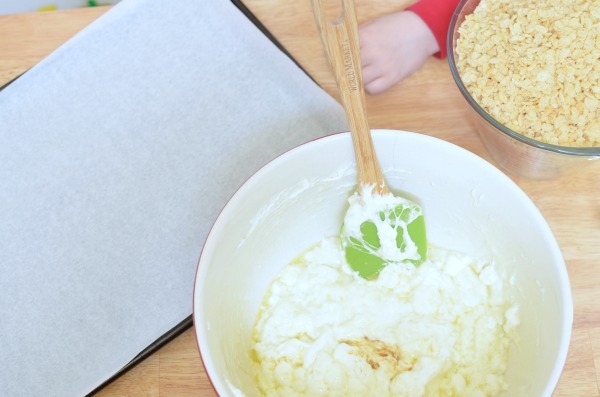 Fold the excess parchment paper onto the rice krispy treats. Using your hands or a rolling pin continue to work the mixture until it is completely flat. Place mixture in the freezer for 5 minutes to set. 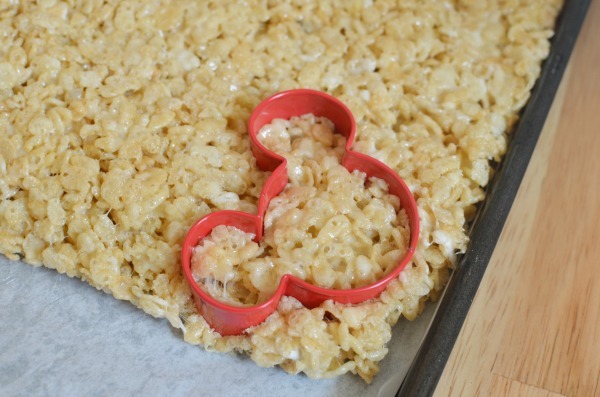 Cut out Mickey shapes with a cookie cutter. Place treats back in the freezer while you prep the chocolate. Melt dark chocolate according to package instructions. Dip just the ears into chocolate. Place back onto parchment and add sprinkles. Set chocoalte in freezer for at least 10 minutes. For optimal serving, treats should sit at room temperature for 10 minutes to soften. Keep leftover treats in an airtight container in the fridge. Freeze up to 6 weeks. What are your family’s favorite Disneyland park treats? 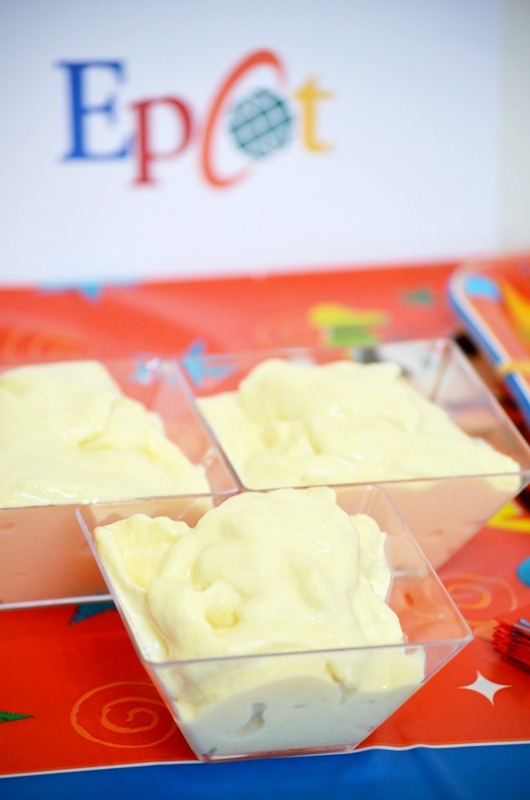 In addition to these delicious Mickey Treats we served up copycat Dole Whip (recipe to come, and it’s super easy!). We kept things simple inviting our friends over for desserts and an evening of fun. 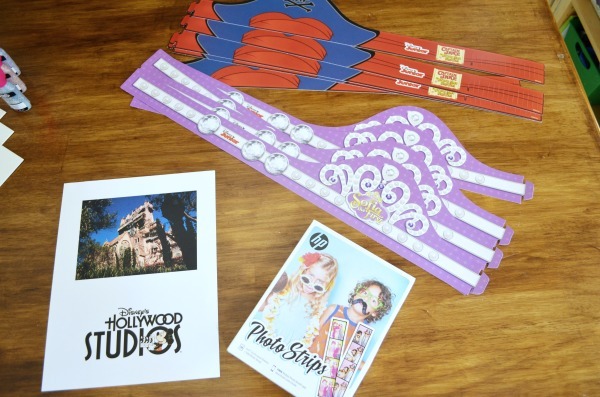 Off in our Hollywood Studios area we had a photo studio setup with these adorable Jake and Sofia headbands. Guests had fun taking turns in the mobile photo studio. 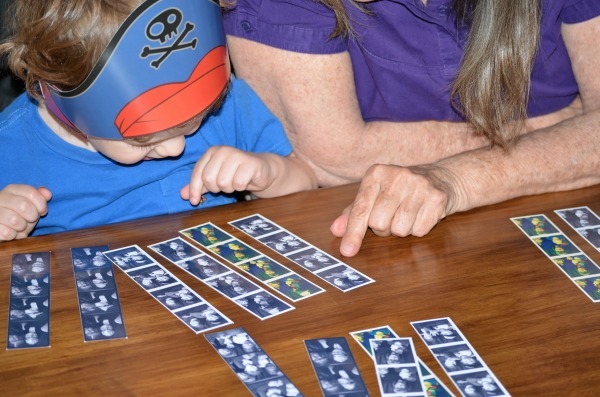 HP provided us with their new Photo Strips to print out keepsakes to take home. I even setup a make your own autograph book with paint from Tulip and some Disney stickers I had on hand. 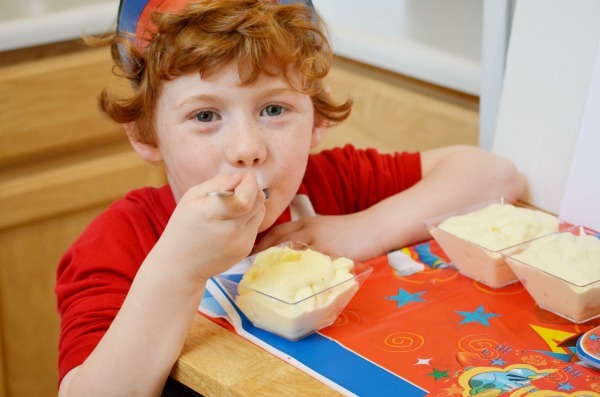 I received free products in order to host a #DisneyKids Preschool Playdate. The opinions expressed here are my own. Wow, great job! I love getting these at the parks. I’d be terrible at the dipping part though. Tara Settembre recently posted…The Hunger Games: Mockingjay – Part 2 Out on Blu-ray!